This map shows radioactive uranium concentrations throughout North America. The white areas represent areas not yet mapped. Many people do not realize that radioactivity occurs naturally on Earth. In fact, it is actually quite common and can be found virtually all around us in the rocks, soil and air. Natural radioactivity maps may look quite similar to normal geologic maps. Different types of rocks have specific levels of uranium and radon, so scientists often have a good idea of the levels based on geologic maps alone. In general, a higher altitude means a higher level of natural radiation from cosmic rays. Cosmic radiation occurs from the sun's solar flares, as well as subatomic particles from outer space. These particles react with elements in the Earth's atmosphere as they come into contact with it. When you fly in an airplane, you actually experience significantly higher levels of cosmic radiation than from being on the ground. People experience different levels of natural radioactivity based on their geographic locale. The geography and topography of the United States is very diverse, and as you may expect, levels of natural radioactivity differ from region to region. While this terrestrial radiation should not concern you too much, it is good to be aware of its concentration in your area. The featured map was derived from radioactivity measurements using sensitive instruments. 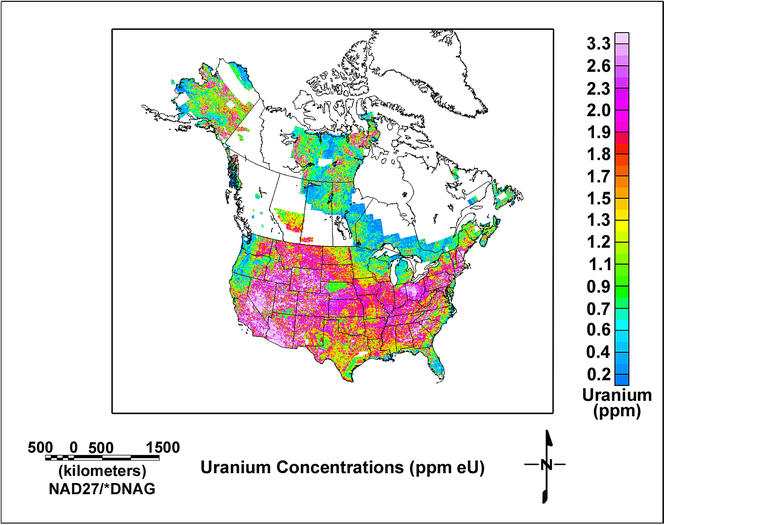 The following explanatory text from the US Geological Survey highlights a few of the areas on this map that show especially high or low levels of uranium concentration. Great Salt Lake: Water absorbs gamma rays so it shows as no data area on the map. Nebraska Sand Hills: Wind has separated the lighter quartz from the clay and heavier minerals that usually contain uranium. The Black Hills: A core of granites and metamorphic rocks high in radioactivity is surrounded by less radioactive sedimentary rocks and gives a distinctive pattern. Pleistocene glacial deposits: The area has low surface radioactivity, but uranium occurs just below the surface. Thus it has a high radon potential. Deposits of glacial Lake Agassiz: Clay and silt from a prehistoric glacial lake have higher radioactivity than glacial drift surrounding it. Ohio Shale: Uranium-bearing black shale with a narrow outcrop zone was scooped up and spread over a large area in west-central Ohio by glaciers. Reading Prong: Uranium-rich metamorphic rocks and numerous fault zones produce high radon in indoor air and in ground water. Appalachian Mountains: Granites contain elevated uranium, particularly in fault zones. Black shales and soils above limestone also contain moderate to high levels of uranium. Chattanooga and New Albany Shales: Uranium-bearing black shales in Ohio, Kentucky, and Indiana have a distinctive outcrop pattern clearly defined by radioactivity. Outer Atlantic and Gulf Coastal Plain: This area of unconsolidated sands, silts, and clays has one of the lowest radon potentials in the United States. Phosphatic rocks, Florida: These rocks are high in phosphate and associated uranium. Inner Gulf Coastal Plain: This area of the Inner Coastal Plain has sands containing glauconite, a mineral high in uranium. Rocky Mountains: Granites and metamorphic rocks in these ranges contain more uranium than sedimentary rocks to the east, resulting in high radon in indoor air and in ground water. Basin and Range: Granitic and volcanic rocks in the ranges, alternating with basins filled with alluvium shed from the ranges, give this area a generally high radioactivity. Sierra Nevada: Granites containing high uranium, particularly in east-central California, show as red areas. Northwest Pacific Coastal Mountains and Columbia Plateau: This area of volcanic basalts is low in uranium.